While most of our attention has been focused on Greece and its massive debt problem, those keeping a keen eye on the world of business know that, in fact, the whole of Eurozone, is facing a serious challenge to its sheer existence. Although some states, like Germany for instance, emerge better equipped in facing the Eurozone crisis with its low inflation and high productivity, a majority of states face severe challenges in retaining the common currency that was created by a landmark agreement in 1992. Today, a huge majority of Europe's people and businesses use the Euro since it is used not only in the 17 member countries which are officially part of the Eurozone, but also many EU (and some non-EU) nations who have signed treaties with the Eurozone countries or have adopted the currency unilaterally so as to be part of the biggest monetary bloc in the world. However, a number of governments, especially in Ireland and Greece, sidestepped these obligations – reinforced in the 1998 treaty – by misreporting the budget statistics year after year. It is alleged that though the EU and ECB (European Central Bank) both knew of this deceitful activity, they refrained from chastising the EU members. Trouble broke out in 2009, when a New Greek government admitted that earlier Greek governments had misled the EU about debt on public account. A further blow followed in the shape of Standard and Poor's cut of Greece's sovereign credit rating to BB+ or “junk”, in April 2010. Matters have worsened since the Iberian countries, Spain and Portugal, have also ended up in the debt net, with Spain's public debt being 72.1% in June 2012 and 92.2% in June 2013. It is feared, with the increased spending, including the bailout money, Spain will end up with a public debt at 100% of GDP by end-2014. 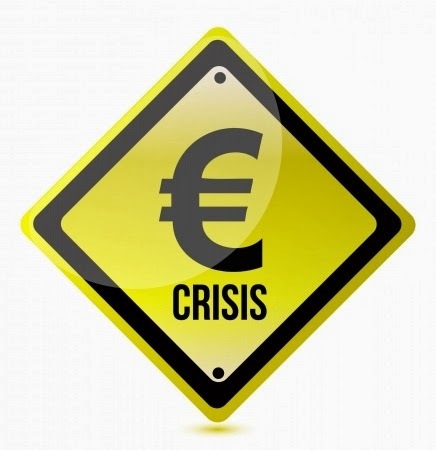 Economic Causes – Some economists, on the other hand, argue that the Eurozone crisis was more due to the economic factors which emerged from the late 2000s. This include the recession of 2008, which affected the European countries a little later but far more severely. It may also have contributed to the bursting of property bubbles in Greece and Spain. In Spain at least, the rising revenue from the property bubble led to the budget absorbing high spending without showing a large deficit or increase in bond yields. Hence, the end of the property boom led to large deficits. Further, since a number of banks had lent generously, and often without proper scrutiny to the property market, they now suffered massive defaults. To save the banks and the national banking systems, a number of countries took over the bank debts, thus transforming them into public liabilities and hence adding to the debt burden. Secondly, banks, it is alleged, engaged in speculation using borrowed funds, instead of using the deposits they had as prudence demanded. Finally, they have to use their money to fund the government deficits, which leads to further weakening, thus reinforcing the pressure on them and through them, the public finances. Political Deadlock – What all observers agree upon is that the political divisions in Europe have exacerbated the crisis by preventing scorching and meaningful reforms. The conflict centers around the difference in perspectives between comparatively well-off nations like France and Germany, and the poorer peripheral nations like Greece, Ireland, Spain, Portugal, Slovenia, etc. Though they have reluctantly agreed to allow their taxpayers to fund part of the bailout to Greece and Spain, the “rich nations”, led by Germany, have done so quite belatedly and without appreciable humor. Germany also remains steadfastly opposed to any action which will raise its inflation, and since proposals of fiscal union (discussed later) will naturally spread out the inflation among member nations, Germany – the land of the first fiscal union or Zollverein – refuses to be a party to any such discussion. However, the cause of the Eurozone crisis is essentially that the Eurozone is a monetary union without being a fiscal or political union. Though a political union is unthinkable, Europe has a long standing tradition of fiscal unions, dating back to the Zollverein of the 1820s and the proposed Germany-Austria union a century later. Without them, the Euro flows – though not freely, due to cultural and political barriers – across economies which have varying priorities, inflation level and public liabilities. This creates uncertainty about the value of the Euro and precipitates crisis. These reasons, by their mutual reinforcement, have created a situation in which some nations like Germany remain highly competitive but refuse to be dragged down by the plight of smaller and weaker economies. The latter, with their highly unproductive industries, high dependence on government spending and inflated government wages, are increasingly at risk of defaulting and thus either falling out of the Eurozone or destroying the Euro's credibility. Seek Fiscal Union and a Central European Bank With “Firefighter” Capabilities – As mentioned above, a fiscal union, with a central European Bank that actually serves as a central bank rather than as a treaty organization, is needed. Fiscal Union would force all members to adopt taxation and spending policies that will complement each other, and thus prevent the Euro from flowing from less reliable economies to safer havens and thus creating imbalances. This would require a larger plan in which budgets of each nation would be coordinated. As of now the existing “firefighting” measures allow for peer review of budgets, but it is seldom that sweeping changes suggested are accepted (except when the member is in dire straits, eg. Greece). This reviewing provision will have to be strengthened further till the Eurozone as a whole gets a single budgetary system. Naturally, a unified (or even complementary) budget plan would require a central bank that will not only issue Euros, but will have the powers of intervention in each of the member states to settle perceived irregularities without bias. However, both of these are seen as infringing on the sovereignty of the states and Germany in particular remains trenchantly opposed to either. Reduce the value of the Euro – Though essentially a currency of the First World and valued higher vis-a-vis the US dollar, the Eurozone depends upon exports, unlike the US which is essentially a net importer (though this may change in the near future due to changes in dynamics of oil and gas production), and thus needs to keep its currency as low as possible. Industries in a majority of EU nations(Germany and Britain being notable exceptions) cannot compete due to the high wages and social benefits and low productivity which raises production costs. Hence, it is all the more imperative that the Euro remain low, so as to prevent these industries from being hurt. At the same time, the low value of the Euro would discourage imports, and thus provide natural protection to the European industries. However, the idea of lowering the Euro is considered anathema, with many citing the Chinese model as a reason why it should not be adopted. For all its faults, China, with its controlled renminbi rate, has managed to remain competitive and productive, and is now the second largest economy in the world. The Eurozone leaders, therefore, will do well to take a few pages out of China's economic book. Send Aid to Greece Along with Direct Intervention – Though this sounds drastic, it was done in the case of Chile in the 1970s, and allowed it to become the richest economy in Latin America. Greece needs direct aid since it is well beyond the point where austerity-linked bailouts can save the day. Though a developed economy and in need of billions of dollars as opposed to the millions that even the most favorably viewed developing nation gets, Greece's position is exceptional and, therefore, needs to be handled with exceptional care. However, it is another matter if the Greeks, already seething at the stringent austerity measures and budget cuts, would allow direct intrusion into their economy, especially since they have long been used to some of the most generous public sector salaries in the world. Eurobonds – Essentially an extension of the fiscal and budgetary unions, the Eurobond has long been debated. Also known as European Bonds, Eurobonds would signify the loaning of money to the Eurozone as a whole, which would then decide which country would get what amount. In 2010, two eminent economists, Jakob von Weiszacker and Jacques Delpla, have suggested that about 60% of their debt relative to GDP should be pooled together into the “blue bonds”, which would be issued by the Eurozone jointly. These would reduce the cost of borrowing while the remainder of debt would form national bonds or “red bonds”, with higher borrowing cost demanding fiscal discipline within the countries concerned. A similar sentiment was echoed in a Green Paper produced by the European Commission in 2011, and EC President Jose Manuel Barroso himself backed the proposal for staggered introduction of Eurobonds in 2012. However, the political imbroglio, which is constant to Europe, has not allowed the Eurobonds to materialize and, therefore, provide stability to the European monetary and debt systems. Let Greece leave the Eurozone – Though unthinkable due to the disastrous effect it would have on the confidence reposed in the Euro and the Eurozone as a whole, the exit of Greece, or a Greek default, would only be temporary. International markets have suffered repeated sovereign debt defaults without going into fatal convulsions, and it is expected that the Greek exit/default would not have a lasting effect. However, the impact it will have might include sufficient dampening of international confidence in the Euro to drive many of the economies just emerging out of the recession, back into it. As the above analysis shows, the future of the Euro and the Eurozone has been jeopardized by both external and internal factors, some of which could easily have been prevented had the Europeans not stuck to their anachronistic particularism. As things stand now, the breakup of the Eurozone appears a distinct possibility since the aid available to the troubled countries is not endless, and it is patent that the crises would recur if structural changes, including but not limited to fiscal and budgetary union, are affected. Though the world might hope and aid the Eurozone, the solutions would have to be found from within, and these require strong determination to introduce instruments like a strong Central European Bank and Eurobonds. Only if these are affected in the near future, and with enough sincerity to be self-sustaining, can the threat to the Euro zone be removed. His email address is aritra9.maj1@gmail.com.